The case for thrift store shopping is a strong one: You can score great pieces on the cheap while doing your part to help your community and decrease your own environmental impact. But while thrift shopping might make you feel your best, secondhand clothes don’t always make you look your best. Clothes that are worn, faded, out-of-season, and just plain cheap can give your secondhand secret away. Therefore, it is important that you do your best to make the most of your thrift store finds. By ensuring that you select quality pieces and take proper care, you can fool anyone into thinking that you bought your outfit at the mall, just like everyone else. I love the fact that thrift and secondhand shopping is becoming more en vogue. 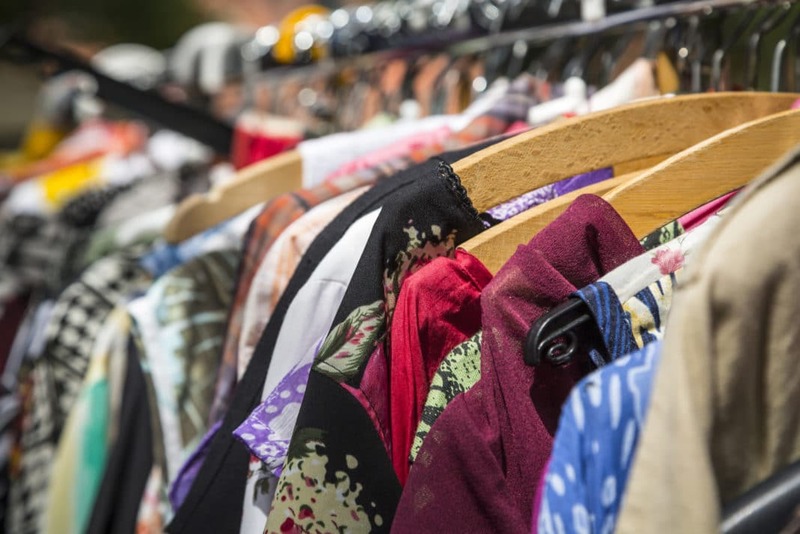 It means that shoppers are becoming a little more conscious of how and where they spend their money, while acknowledging that clothes don’t necessarily lose their value just because they were pre-loved. Use these tips and you’ll always be well-dressed, no matter how many times an item was worn before you snagged it. One of the best ways to get the most bang for your buck while thrift shopping is to make sure that you scope out an affluent area. Affluent areas mean affluent people, which increases the chance of finding quality goods, big-name labels, and better fabrics. When Does the Store Restock Shelves? Thrift stores generally do not put out new goods every day. In fact, many only restock one day per week. By finding out when a store restocks, you’re guaranteed to have first pick of the higher-end merchandise that comes though the doors. Are There Any Discount Days? Many thrift shops have rack-clearing events once a month to make room for new merchandise. That can mean deep discounts to the tune of 25% to 50% off certain items – or even your entire purchase. 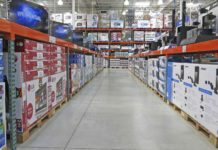 What is most important to you: huge discounts, or new merchandise? Regardless, shopping in a more affluent area gives you the best chance for top-quality goods. Due to the low prices of thrift stores, it can be tempting to fill up your cart with impulse purchases. But before you buy that polyester pantsuit, remember that in the long run, high-quality clothes always look better than cheaper fabrics. By specifically looking for name-brand items that have a reputation for being high-quality (for example, Banana Republic for work wear), you can be sure that your thrift store finds don’t fall apart or show wear too soon. Natural fibers always look best over time, even if they cost a bit more. Seek out cotton, linen, and leather, and avoid fabrics such as polyester, nylon, or pleather, which can definitely look cheap and worn over time. Hunting for name brand goods? You might have better luck at consignment stores, which either purchase from or split proceeds with previous owners. Many consignment stores have strict rules regarding name-brand clothes, so while you might pay more than an average donation-driven thrift store, you can be assured of name-brand stuff. 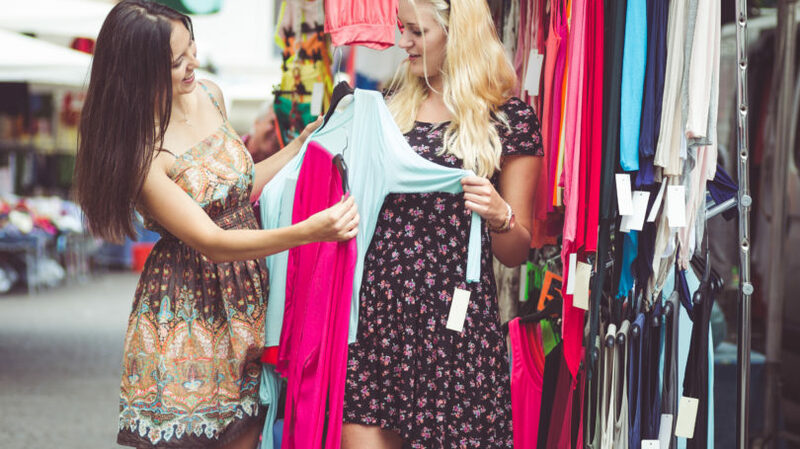 Of course, that’s not to say that you can’t find name-brand clothes at the thrift store – it just means you’ll find them more reliably when shopping consignment. Head to a mainstream retailer and take note of what’s trending. Do you see a ton of leopard print? Is everyone going with gold accessories? How about leather embellishments? Then, head to the secondhand or thrift store and start looking for items that embody those trends. The point is, fashion is cyclical: You might find a vintage leopard-print belt that is years (or even decades) old, but totally current. There are a few things that smart thrift shoppers pass over because they’ll always look cheap or clearly worn. By knowing what you should avoid when shopping, you won’t get stuck with a garment that is completely unwearable or a dead giveaway to your thrift shopping habit. Clothes With Heavy Embellishments. Secondhand clothes that feature embellishments such as sequins, heavy contrast stitching, and glitter might look cute, but remember that they’ve already had some use. Even if the embellishments seem secure now, over time they can loosen and even fall off. What’s more, you might not even notice that embellishments are missing when you first grab the item. Instead, look for quality basics with fun fabrics, instead of sewn- or glued-on embellishments. Damaged Clothes. A hole may seem like no big deal if you’re a great seamstress. However, if you have no idea how to repair items, skip over the stuff with holes, embellishments that are falling off, and other areas of clear damage. If you don’t have the ability to fix it, it’s a waste of money – no matter how good of a deal. Clothes With Stains and Smells. Give a piece of clothing a good once-over. Are there stains? Does it have a funny smell? These are two red flags that the item might not be the best quality. Even if you could wash out the stains and smells, it’s a sign that the previous owner might not have taken good care of the item. One thing I always advise people to buy from thrift shops is jewelry. There is usually a massive selection, and often you can’t really tell the cheap jewels from the expensive ones. Head over to the accessories section of the thrift store and load up on statement necklaces, vintage brooches, eclectic watches, and large rings. Adding them to your wardrobe basics and thrift store finds can make everything look more expensive and of better quality. Just be sure to check that stones are firmly glued, and watch for broken clasps. Jewelry is also a great place to start if you’ve never gone thrift shopping before. 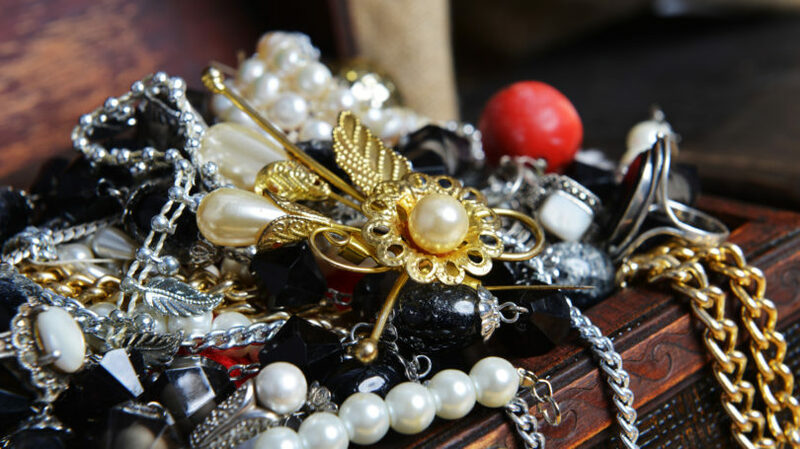 Most jewelry doesn’t show much wear, and many thrift stores have lots to choose from, so it’s a little less daunting than hunting for designer goods among the racks of clothes. Once you’ve taken your thrift store treasures home, it’s time to check and see if there are any signs of wear, many of which can be removed by a gentle hand. If the Clothes Are Faded: I swear by Rit dye as a way to make faded clothes look new again. A bottle of dye costs about $6 at Walmart and can breathe new life into old clothes. Just choose a color close to the original hue of the garment (or, if you’re feeling adventurous, dye a lighter-colored item a new shade completely, since white and tan take colors well) and follow the package directions. If the Clothes Are Pilled: If you found a wool sweater with signs of pilling, never fear – there’s a simple fix. While you can definitely use a sweater shaver to get rid of those little fabric balls, I use a clean razor. With a very light hand, draw the razor down in the direction of the fabric’s weave to easily remove pilled-up bits. Just use a light hand, since pushing on the razor could actually slice a hole in the garment. If the Embellishments Look Worn: If you’ve gone against better judgement and grabbed something with embellishments, you might want to remove them if they look like they’ve seen better days. A sharp pair of scissors can make quick work of removing worn and outdated sequins and fringe. By taking a few minutes to spruce up secondhand clothes, they’ll look closer to being new, which also means you’ll enjoy more wear out of them yourself. Before you wear clothes from the thrift store, you should always launder carefully. Always check each item’s laundering tag individually, since some might be fine in the regular wash, but certain fabrics (such as cashmere, silk, and wool) may require hand washing or dry cleaning. Once you’ve separated the delicates, gather all the items that can go through your washing machine and choose a hot water cycle. Pre-treat any areas that may need a little extra attention (such as the armpit area of blouses) and toss your items into the washing machine. Hot water cleans the clothes but can also kill any bugs that might have hitched a ride on your new-to-you articles of clothing. If an item requires special laundering, always take the time to do it before your first wear. Clean secondhand clothes are a must if you want them to look polished and of good quality. If I could give one piece of advice for always dressing well – whether clothes are new or from a thrift store – it’s to make friends with a tailor in your area. Not all secondhand clothes are going to fit like a glove, but it’s hard to pass up a designer deal. Therefore, you can make that amazing J.Crew blazer fit perfectly by handing it off to a tailor. What a tailor charges for minor alterations depends on where you live, but in general, you can expect to pay about $15 to $20 for pant hems, $20 to $25 for jackets and dresses to be fitted, about $15 for sleeves to be hemmed, and $20 to $25 for dresses and skirts to be shortened. If you got the item for a steal, adding $20 to make sure it fits properly is a small investment. You can even ask a tailor to swap out outdated buttons or tighten loose seams for a small fee. Secondhand shopping at thrift stores, consignment stores, and even online can mean deep discounts on clothes. But when shopping secondhand, quality is always better than quantity. By taking your time and shopping for the best items, you can come home with items that look like new after a little TLC. The best part? Thrift shopping is almost always in your budget. How do you make thrift store finds look more expensive?